Agreed on that testing part as well. I am pumped to see if the Supercaliber is legit and what they do with a Top Fuel update. Would love a Top Fuel that is 120/120 and a bit slacker. If the Supercaliber is real then there is room for that Top Fuel. A great update would be a bike where the carbon could stay in one piece. What do you mean by this, have you been unfortunate with carbon? Love my Trek, but I have suffered from multiple layup failures in the first year of ownership. 2 wheels, one seat stay and now one chainstay on my second frame. I was warned, by a local Pro, whose wife (also open/pro rider) has gone through the same issues. I love the bike though. If somebody is going to constantly battle Nino, it will be MDVP , others will shine here and there, but doesn't see nobody else battling for overall. I don't recall MVDP putting Nino under any serious threat last year on the full course. Maybe short track. I'm excited to see what Kerschbaumer will bring. MvdP spreads himself too thin by racing 12 months out of the year. He will never be the best XCO racer that he could be because he's also concentrating on CX and Road Racing. Whereas Nino concentrates on being ready for the XCO World Cups year round. Things got interesting, suddenly 1 min is doable for the remaining stages. It will be a close battle though. Not that interesting anymore, at least based on current result which looks pretty weird for me... all time gaps are exactly on 1min. But based on splits (last one on km 88.5) Schuter and Forster had about 6:20 advantage on Fumic/Avancini, so in finish they should be in lead for some 5min. Not sure what you are implying, but at first hydration point jersey leaders were already 3 minutes behind race leaders. It still not over though, with 5 minutes they definitely have the upper hand, but any issue comes up and it might not be enough to cover it. Yikes, that seems like poor poor manufacturing quality. Was that on a top fuel? I personally don't trust carbon wheels, carbon bars or carbon stems, but frames can be strong as hell. However, it seems everyone has dropped their carbon quality, around 10-15 years ago carbon frames were very strong and extremely durable. Now, failures are not uncommon even in premium brands. First off my Giant advanced frame was unbelievably reliable. Also my Carbon Light bike have been put through the ringer and are fantastic. First wheel cracked at the spoke (May have been factory over tension). Discovered by my builder when they laced in an i9 hub to replace the bontrager garbage hub. Replacement rim had a bubble on the lip that caved in and sliced a tire. Seems to be holding up despite this defect. I thought about putting epoxy to fill the slight imperfection but haven’t yet. Top fuel 9.8 cracked on seat tube behind size sticker when almost new. Took me months to find the source of the noise. It was non impact related. They gave me a Warranty 9.9 frame which has a carbon Chainstay and super thin clear paint. (Saved 250 grams) Chainstay had a non impact related failure from poor layup. They are refusing warranty and I had to pay 420+ shipping and tax and install for a new Chainstay that Doesn’t even match my frame because they couldn’t get that color for 4 months! My Chainstay is now wrapped in 20 grams of bar tape to protect it from any possible rock strike just in case. called it, that thread got axed. So that’s good news that the SuperCal is truly in the pipeline. Was mentioned that Jolanda had posted on Instagram she was on a #secretmission doing some testing. Saw this today from her and IFHT with the mountain bike conveniently obscured. 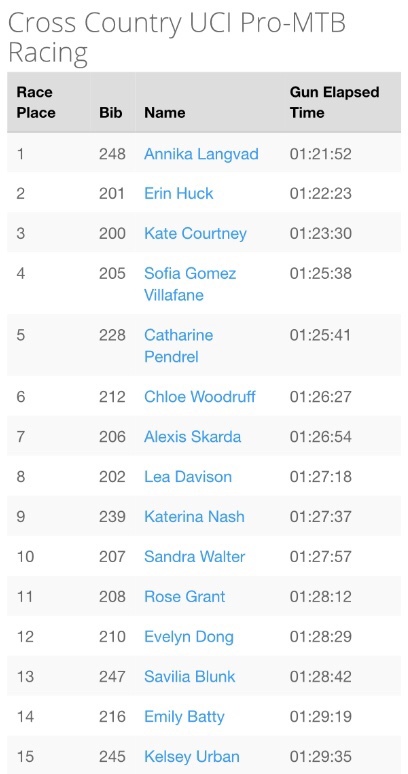 Another win for Kate yesterday in SoCal. Her last lap was her fastest with Erin Huck 15 seconds behind her, so I am guessing she had to work for it. Super fast and flowing course. He does, but let's just appreciate it, as it is truly special. Cross Country, Cyclocross or Road, men or women, they are all fun to watch. Last edited by j102; 3 Weeks Ago at 06:28 PM. Awesome! What was it like, riding with her? I'm a huge fan of Jolanda, especially because of her technical skills. She shreds hard! She lives here lol. So it's not odd. Her boyfriend is Luca Shaw. She has been here a lot this off season. She just came here from a road race in Europe this past weekend. It was like riding a bike. She is a normal person, riding her bike. I was just messing around about the photo of her bike lol. It was a basic Trek fancy road bike. But weren’t you in Ohio? Only in your mind. Unless Etowah is in Ohio. Lane is not a person but a metaphysical conundrum. He is everywhere and nowhere at the same time. You guys are clearly confused who I am. My name is Lane Myers, and i dont eat pizza, live in Arizona during the summer, or Ohio in the winter. I live in Brevard. So does Luca Shaw and Jolanda Neff, big deal. I was mostly trying to make a joke about them wanting to see the bike Jolanda was on then showing them a picture of her on her road bike. Imagine this. A world cup dh racer, a world cup xc racer, a top US pro DH racer, the NUE champion, and top US pros all live in Brevard and ride bikes together lol. I know its hard to imagine normal people being normal people. Your comment about the pizza lets me know you have absolutely no clue who i am. My van doesnt even have floorboards. I cut them out with a grinder cause they were rusted through and screwed some sheetmetal down lol. Im in the process of starting a youtube channel and all that. Then you can see things for what they are not what you imagine. Wake me when this thread is actually about WC XC. And you were on a fatbike dropping her on every climb right? We all know the routine. Last edited by MessagefromTate; 3 Weeks Ago at 03:17 PM. Just watch Jackass, basically the same thing. I'm just hoping my next Top Fuel frame failure is after the new bike launches. THE Lane Meyers that skied down k12 on one ski? Sorry I’m newer to this forum, can someone please open a separate thread and explain the history and phenomenon that is “LaneDetroitCity”? Being a local from the Detroit suburbs myself, I hate to see the good reputation and name of Detroit being sullied. Suburbs? You know what we call the people from the suburbs who claim to be from Detroit right? I see no USA Cycling results for Lane Meyers. You coming to Marathon Nationals? He's been banned from here numerous times, that pretty much sums him up. Oh and he dropped Catherine Pendrel at a trail named Pontiac Lake in metro Detroit. That was one claim I remember. off topic but i've got to know: what do they call them? jive turkeys, rat bastards, what? Lucky, I think. They made it out. Please show a multiple world champion more respect. "Maxime Marotte, mountain biker of the Cannondale Factory Racing, has shared a photo in his social networks after an unpleasant event that he lived last April 2nd. While he was training on the road, a car approached him and one of the people inside began to shoot Marotte . Fortunately, we are talking about a compressed air gun and not a gun. The result is several wounds on the back and one on the elbow , like the one that can be seen in the photo shared by the cyclist himself. A detestable fact and that should have been a good scare to Marotte, who would have enough to worry that no car was off track. Although, following this, Marotte "jokes" in his tweet saying that at least respected the safety distance ." Its pretty disturbing the things that people do, I hope he grabbed a license plate number. And what a win. He made seasoned pro's look like second tier riders. Anyone know if there is going to be any streaming of the Pan American Championships tomorrow? There’s a Facebook page doing live feeds. It’s called Play Sports Mexico. oh Van der Poel, don't go waving for the team car when your in the middle of trying to save it! Obviously not sure, but seemed to me he had a broken handlebar or stem and was doing that for balance. He would have otherwise already stopped. EF! Makes me happy to see those guys win every once in a while. Anton Cooper just took the Continental Championships XCO a few minutes ago. Not the strongest field, nonetheless this man is one of only a handful who seem to have a chance of defeating el Nino. Really hoping to see him achieve that next level performance this year. He seems like a hard worker and fighter with a really good attitude. Check out the CXHAIRS YouTube channel. He has been shooting video of the U.S. Cup races and putting together video summaries. And he said on Twitter that he would be at Sea Otter, too, but there would be no live streaming. The power files I see out of the Sea Otter race are absolutely insane. The normalized power for one of the top finishers in the mens race was 400!!! And that is for a 70kg rider. 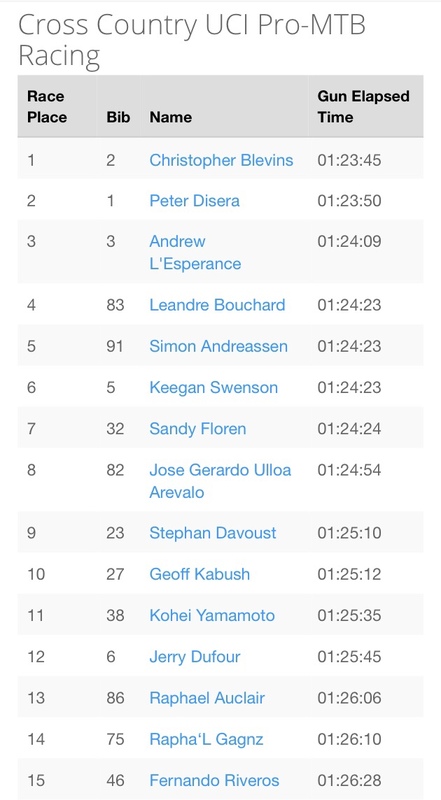 Sick to see Geoff Kabush still doing top 10 rides. Sundays race should be a good one. Truly unreal. And these guys are not even the worlds best. Blevins is the real deal. I know it seems like a long shot, but I wouldn't bee too surprised to see him medal if he gets to Tokyo. Good to see Rose Grant back at it....and kudos to Catharine for a top-5! Probably too early to be speculating about WC XCO form, but am a little surprised that Batty is so far down. Anyone know if she had a mechanical? Batty mentioned being sick in a recent IG post/story. LMN... reading the Trek 2020 MY thread and the speculation around the new XC bike... on the WC circuit is there a place for a modernized “soft tail” given how the courses are designed nowadays? I know Trek has got to be investing more into the XC side after picking up Neff and Batty knocking at the door, but didn’t see a soft tail coming given the increasing technicality. I don't see a need for a softtail. If you look at the Trek Pro-caliber the frame is 1500 grams!!! An Oiz or a Spark is 1800 grams. The Procaliber frame weight combined with the price points being $500 within a Top Fuel for every spec level is a tough sell. Hope Trek resolves the hardtail issue as well as their revised full squish bikes. Thanks, I was thinking the same but was curious maybe I was missing something. BMC has a softtail, but I would assume most of the sponsored riders choose the new BMC fully this year. The softtail rides really nice though (my brother rides one), rooty tracks are almost as fun as on a full suspension. Just watched Flanders with a week delay. What a race. His wheel broke when bunny hopping over road furniture and fully collapsed when he raised his arm after. What is interesting is that even with this full spring classics winning potential, he is still not backing off 2020 XCO Olympics as goal, and won't race road after Amstel Gold next week, again going full XC season. He did tell Sporza that the atmosphere on the Kwaremont was beyond what he ever experienced, and that he will return to the race, in hopes to win it. He may burn out in this vicious CX-Road-XC triangle, let's hope not, and enjoy it while it lasts, this kind of versatility is not seen that often these days. Not techy, but a fun course! This weekend marks the start of the MTB season. Mid-april is when all the European series start going and you get to view on how people have wintered. I suspect that we will be seeing some people come into the season pretty slow. This year most of the big races are in July and August. Someone could be absolutely terrible right now and have a killer season. Still, it is interesting to see who is going well. MvdP blew the doors off of Julian Alaphilippe, Tim Wellens and Michael Matthews at Brabantse Pijl today. I was watching the race and thought he was going to be outfoxed by those roadies...Bling had no gas, Wellens is not known to be a sprinter and JA had the best chance...and nope...not even close!!! I wonder what his power numbers look like in a race like today!!! Super impressive, not only strong but he must be pretty confident as well to launch a sprint from the front against Alaphilippe and Matthews. Really looking forward to the mtb races now! World Cup or Non-World cup? To World Cup or not to World Cup, that is the Epic question..